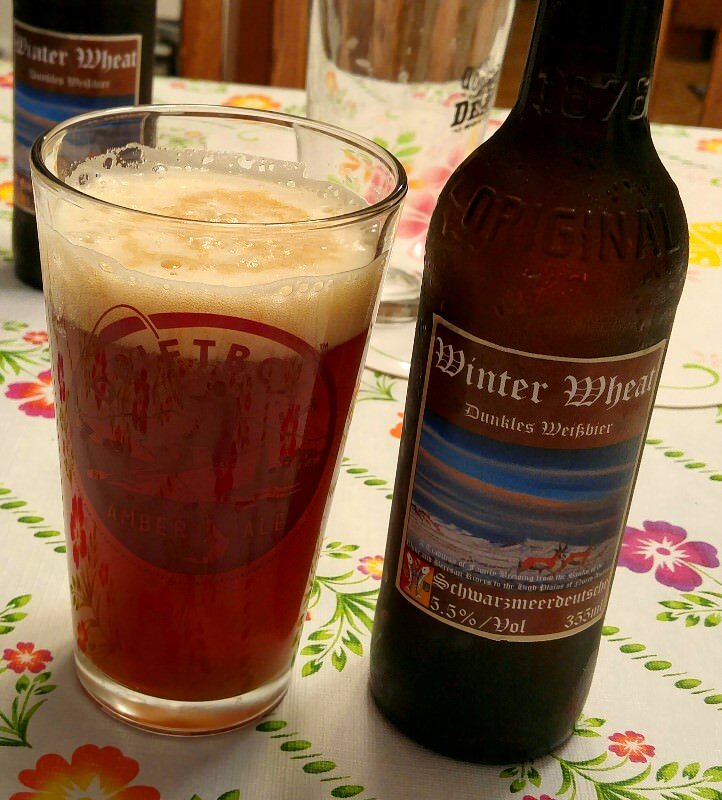 This beer fits very comfortably into the category of a Dunkels Weißbier; Brooklyn Brew Shop describes it as "deep and rich, with a malty finish." BBS also points out that the choice of yeast is important, in order to impart the special flavor characteristics as well as a "weightier mouth feel and substance." 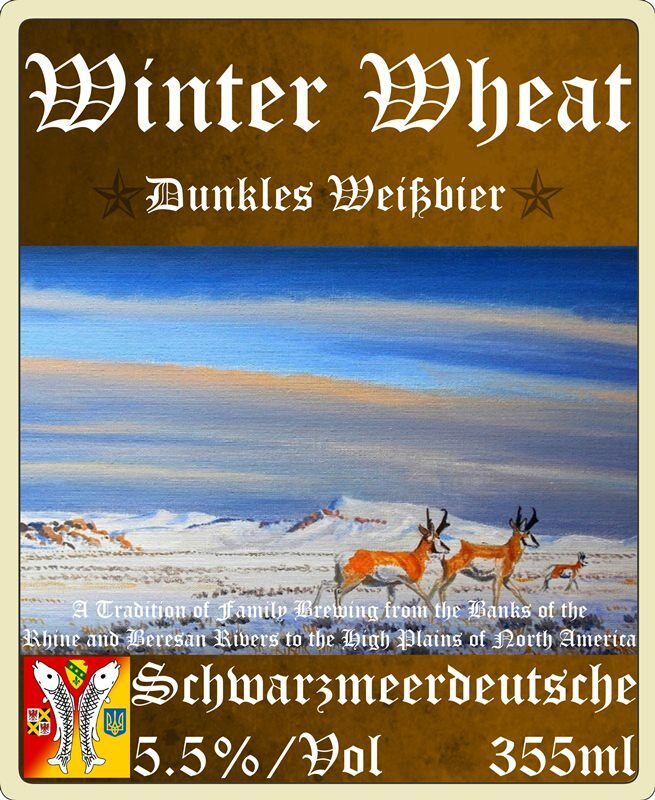 I am very much a fan of wheat beers, and my tastes tend to lean toward exactly what this beer is described as being, so I am really, really looking forward to this one, especially in the winter as I sit and watch the snow fall outside. This 1-gallon batch uses mostly pale wheat malt, with a combination of Munich, Biscuit and Special B to provide a characteristic colour profile and unique flavor profile. For this project, I decided to try Weyermann's Floor-Malted Bohemian Wheat malt, as it caught my eye and I am interested in seeing what it can do for a German-style wheat beer. For the Dark Munich, I decided to try Avangard's offering, also from Germany. I like the profile that this malt offers, and am considering using this for a couple of other brews, including an American Pale Ale that I will be brewing before too long. The Biscuit and Special B are Belgian; from Dingeman's. Based on what little I know, I am assuming that these two malts are going to provide the unique qualities of this beer, especially in terms of colour and flavour. The hop profile for this recipe is interesting, and in my opinion unique as well. The bittering and flavour hop is the noble Spalt, which is related to Saaz and Tettnanger and has roots stretching far back into Medieval times. What I really like is that this hop hails from Bavaria, where some of the world's best wheat beers can be found, in my opinion. The aroma hop is the much more modern Sorachi Ace, a citrusy, spicy hop from Japan, of all places. I find this combination especially interesting in that I would normally think of the Sorachi Ace as more for bittering, with the aromatic Spalt coming later in the boil; however, in this recipe, the roles are reversed, and I am expecting an intriguing beer to result. The recipe says that the beer should come out at 5.5% ABV, and I'd say that I'm pretty darn close to that. A note on the hops/IBUs - The recipe doesn't specify the specific IBUs for this beer, but using the "estimated" AA percentage on Brewer's Friend (4.5 for Spalt, 11.1 for Sorachi Ace), I came up with 15.75 IBUs. When I plugged in the actual AA percentages based on what the packages said, however (3.7 for the Spalt, 9.1 for the Sorachi Ace), the IBUs fell to 12.94. I don't consider this a huge difference, but I am wondering if I should adjust the schedule to meet the original 15.75 IBUs; or, perhaps, split the difference between the two and adjust to 14-ish IBUs. I know that I am probably splitting hairs, here, but that is part of the fun of developing these beers, so I will think on it; I'll also probably also email Brooklyn Brew Shop and see if they have a number in mind. I've got an image in mind for the label that I want to create for this beer, and will see what I can do with that by the time I brew it; it should be a good one, I think, and I'll post more on that when the time comes. That's all I can think of for now. As always, I invite and would appreciate any thoughts or feedback on this, so feel free to follow along or join in the thread as you please. We have the IBU's for this beer right around 15. That being said, we're sure it would taste great anywhere in that range. Hops are a natural item so its always impossible to completely know how much alpha acid is in each cone. Because of this, the AA on the packaging is usually estimated. We would try to get the IBUs in that range but don't sweat it too much. As long as you're in the ballpark the beer should be great. Hope this helps. Let us know if you have any more questions! Based on this, I will adjust my hops schedule up just a bit (each hop in proportion) in order to reach the 15-IBU target. It is certainly very small, especially on the 1-gallon scale, but easy enough to do. I brewed this beer last night, 12 February. This is another brew that went very well, with no real complications or incidents; I was really intrigued with the colours I was seeing and a lot of the aromas I was getting, and I think this beer is going to turn out very well. Mash - While I was measuring out the grains for this, I was very impressed with the German floor-malted wheat as well as the Dark Munich. Both of these malts had a really nice look to them, if that makes sense; they appeared rustic and hearty, perfect for a dark winter beer. The Belgian Biscuit and Special B malts were also very nice, as well, with the Special B giving off incredible, raisin- or prune-like aromas that also seemed to have a bit of toffee. The smells were very enticing, and I remember thinking that we might have a really good thing here. As for the Biscuit, more on that, later. During the mash, I was able to hold temperatures quite well between 148 and 152, which is just about right where I wanted them to be. The combination of malts were starting to smell even better than they did on their own; but as I would soon find out, there was even more where that came from! Sparge - There were not real complications here; the sparge went a little slow, but it was nothing terrible, considering that the grain bill is well over half wheat. The resulting wort was a nice, toasty-looking brown, and looked very promising. Boil - The boil was also without incident; hop additions were on time and everything seemed fine. I was really impressed with the Spalt hops, and I am thinking that they will do well with this beer. For me, the jury is still out on the aroma hops, which were Sorachi Ace. They smelled pretty unique, with some citrus and even a little herbal character similar to dill. It's not that they were bad; it was simply much different than anything I've ever encountered before. I'll have to wait and see how they are with the finished beer before I know for sure. During the boil, the Biscuit malt really started to shine - I have used Biscuit malt before, but this was the first time I really noticed the aroma as it wafted through the house. Talk about incredible! It really did smell like some toasty biscuits were being baked, and in all honestly I was loving it quite a bit. 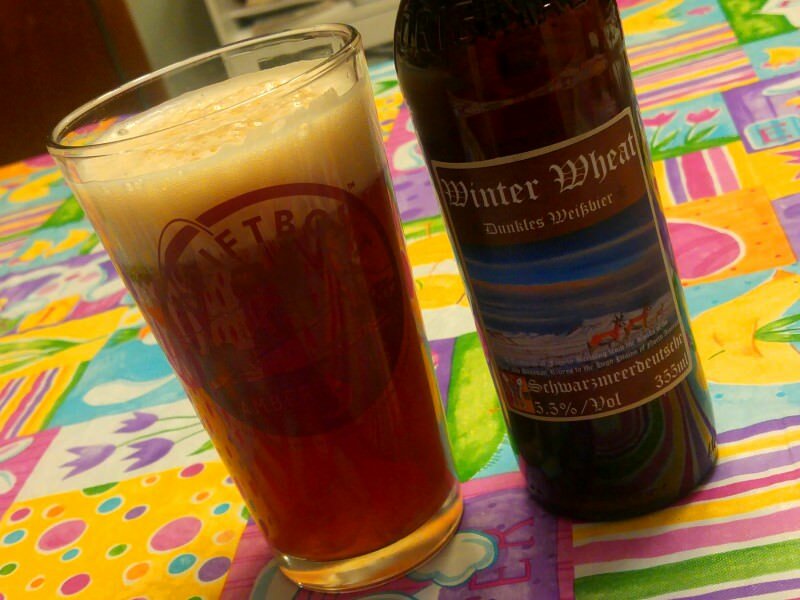 Everything about this brew so far was pointing to a really special winter beer. Chill-Down - No worries, no troubles; the wort chilled down in an ice-and-water bath quite quickly. Transfer to Fermenter - Everything was fine here. I ran the wort through coarse, medium and fine mesh screens on my funnel, so that I could get as much hop and break material as possible in order to hopefully minimise trub loss. 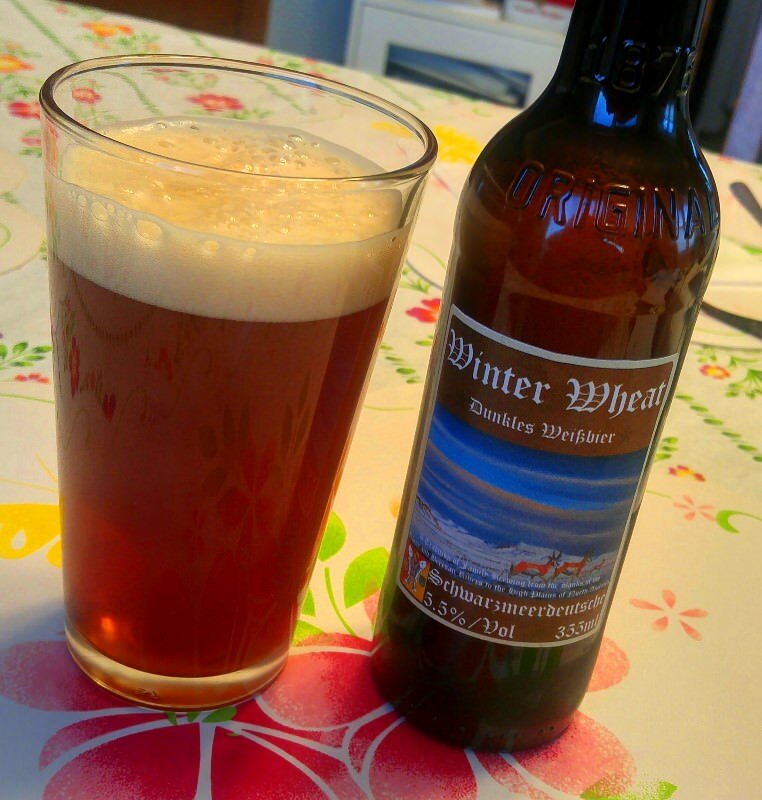 This has worked well in the past and has the added benefit of healthy oxygenation of the wort so that the yeast can grow in a healthy environment; having said that, this is of course a wheat beer, so I am neither expecting nor wanting a crystal-clear beer. I did end up adding about 1 cup of water to the fermenter in order to reach the 1-gallon mark; no big deal...it can't be perfect every time! Pitching Yeast - as noted above, I used DanStar's Classic Munich yeast, known in German brewing circles to be the dry version of Wyeast's "Weihenstephan" strain. I doubt that my beers will ever measure up to Weihenstephan; however, there's nothing wrong with helping the odds a little, here and there. Once I added the yeast, I agitated the beer for several minutes in order to fully integrate the yeast as well as to further oxygenate the wort. After that, I set up my blow-off tube and put it put it in my closet, where it would be as insulated as possible for temperature stability. This morning, the temperatures were a couple of degrees lower than I would have liked, which is not surprising considering the age of my house and our north-Montana winter. I did a some adjusting and will check on the results as soon as I get home. I did note, however, that fermentation was definitely in the beginning stages; meanwhile, my West Coast Golden Strong Ale, sitting right next to this beer, was chugging along quite merrily. So far, I am thinking that this could be one of the best beers that I have yet brewed, based on these incredible German and Belgian malts that I used (and hopefully on the yeast, as well). I am looking forward to seeing how the ingredients all play together and am optimistic that I will get some really fine results. As usual, I will remove the blow-off tube on BrewDay+3 and replace it with an air-lock; I'll then bottle it at 2 or 3 weeks, depending on how things are going. After that, I'll sample it as soon as possible; since it is a wheat beer, that will probably after 2 weeks of bottle conditioning, plus one night in the refrigerator. If anything noteworthy happens between now and then, I'll post about it here. Special B really is a cool malt in my never very humble opinion! I keep it around and it seems to sneak its way into a number of different brews. I started adding it to a couple light weight low abv basic dry stouts that were a bit one dimensional. It is amazing what even a small amount can add to the over-all flavor. I use it in browns, milds, and have even added a couple ounces to reds and ambers as well. I don't compete, so if my color is off a tad I am FINE with it. I am not a big fan of the Sorachi ace hops - something in it that does not sit well with my taste buds, that I can;t put my finger on. Is this your first go around with it? It looks to be an interesting brew, and has a lot of the things I love in a beer, I am looking forward to hearing how it turns out. Hi, John - I hope all is well! I don't think I've used Sorachi Ace before; I didn't mind it too much, but it was a little different with that herbal quality. Normally, the first time I prepare a recipe (including beer), I follow the recipe as closely as possible, then modify it to my whim or taste after that. In this case, I might stick with all Spalt or some other noble hop for future brews; but then again, it might be great! I didn't smell anything objectionable or "weird" while I was pouring the wort into the fermenter, so maybe it blends in better than I thought it would - we'll see how it goes! Fire away, I'll give it a go! Do you have my mail? Lots of maltiness, lower IBU, range of flavors right up my ally! I am thinking 14-21 days cold crash and into the keg and this might be a nice grain to glass in 30 day or less option! My weight restriction got lifted today (Partly ) enough i can tote around beer making goodies If i don't get too carried away!Still can't do any real work - so it seems like a good opportunity to brew a few things. Sounds like a plan ~ I'll try to send it off to you as soon as possible. I bottled this beer yesterday, 11 March 2018. Everything went well, I think. and I was able to get 9 bottles out of this 1-gallon batch. The beer looks great, a nice, dark coffee colour...maybe a tiny shade lighter, depending on how you like your coffee. Toward the end of the transfer, I got a little more trub that I would have preferred into the bottling bucket, but I am not too concerned about this...it is a hefewizen-type beer, after all. I had about half a bottle left over to sample the beer, and over-all, I liked it very much. The malts work really well in this beer, both with the aroma and the flavor, making it something that is on the edge of addicting. There's some toastiness and maybe a little toffee or caramel there, and I really like it. The bitterness is also just about right...I wouldn't bother trying to improve it. There is a bit of something in the aroma and taste that is a little different; I am guessing from the Sorachi Ace hops. It's nothing terrible, just different and not what I expect in a beer like this. I'll see how it is after carbonation and conditioning; in a worst case scenario, I will keep the hops all-spalt next time. This might be a perception thing, but the beer seemed just a bit thin-bodied, which is something I wasn't expecting either; once again, not much - just a bit. Having said that, my perception could be off; the beer is not yet carbonated and my mash temperatures could have been a hair low, or it could be just the way it is supposed to be. Over-all, a good one - worth brewing, and worth brewing again! I had been very eager to try this beer since I brewed it, and it did not disappoint. I'll have to give a more detailed report on it next time, but the malty character of this dark hefeweizen was simply outstanding, deep and rich. The bitterness from the hops was subtle, but seemed to balance vey well with this beer. There was a little bit of something unique in the finish, probably the lemon character of the Sorachi Ace hop that I've heard a lot about. It wasn't bad at all, and gave the beer a refreshing twist right at the end, but I personally would have preferred something a little more traditional; I think that the next time I brew this beer, I'll use a more traditional hop to finish. In all, a very good beer that nails it beautifully with the grain bill, in my opinion. My suggestion is to try it with the Sorachi Ace to finish, as written, and see what you think. The beer seemed even better than last time; the finishing hop seems to have integrated itself a little better, to the point where it's there, but it's not competing for attention. This makes a pretty nice harmony, and I think it goes well with the grain bill, which is by far one of my favourites of all time. This dunkelweizen is really turning out to be an amazing beer! The hops and malts are right at a wonderful balance, playing off each other very well. The mouthfeel is incredibly smooth and the taste is right on point. There's a bit of spiciness in there as a consequence of the yeast - a bit of clove and banana, as expected. This spiciness plays extremely well with the rich, dark malts of the beer, making it an incredible joy to drink. My dad, who also enjoyed one of these rated it quite highly; he spent a year in Germany when he was in the army (in fact, I was born in Wurzburg), and he said that this was as good as almost any of the beers that he enjoyed while there. I might come up with something other than the Sorachi Ace hop as a finishing hop; but the truth is that there really is no need to and it would be a personal preference only. This recipe is very highly recommended.